From ‘Myths, Lore, & More for Travelers to Explore Globally’ from Imagine Global. Legend has it that in the 9th century B.C., Celtic Prince Bladud was struck with Leprosy, and thus left the royal court to become a swineherd. When his pigs he was looking after, who also suffered skin deformities, stumbled into a pool formed by naturally occurring springs they were healed. Bladud himself entered the pool and was healed of his leprosy. For this reason, he founded a spa at the site of the miracle and dedicated the land which is present-day Bath, England to the Celtic goddess of healing and fertility, Sul. Around 43 A.D., Roman conquerors took over the settlement and re-named it Aquae Sulis, translated waters of Sul. Romans also celebrated the purportedly miraculous nature of the waters and erected bathhouses with towering columns, to their own goddess of healing and wisdom, Minerva. Rediscovered in 1755 the structures and history contributed to the 1987 designation of the destination as a UNESCO World Heritage Site. The renown of Bath was widespread, with Bladud referenced as the father of Shakespeare’s King Lear. Two hospitals for the poor were constructed in Bath, The Royal United Hospital and Bellott’s Hospital resulting in pilgrimages by those suffering a wide range of maladies. 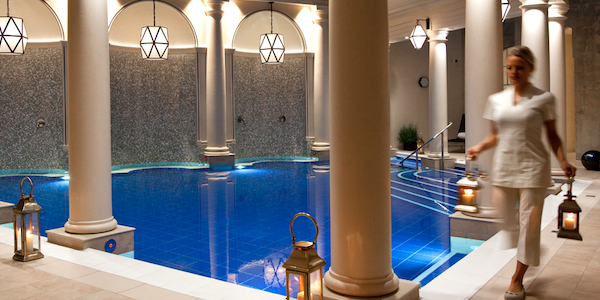 For modern-day sojourners dealing with a range of illnesses, from gout (aches and pains related to arthritis) to skin conditions, to infertility, there is one luxury hotel in Bath with direct access to the thermal waters, occupying the two former hospitals. After years of renovations, The Gainsborough Bath Spa opened to the public in September of 2015. The hotel’s water source is directly supplied from one of three famous hot springs in the center of Bath, the Hertling Spring. Believed to find its source in the rain which fell 10,000 years ago, seeped over a mile beneath the Earth’s surface, it now bubbles to the surface with mineral-rich healing properties.